Using rapeseed oil makes this a healthier alternative of a family favourite. 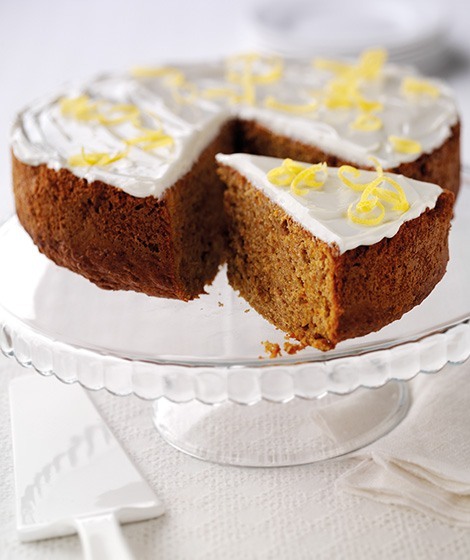 This cake contains 60% less saturated fat per slice by using rapeseed oil in place of butter. Grease and line the base of a 21cm round cake tin with baking parchment. Mix together the flours, baking powder and sugar. In a separate bowl, whisk the eggs and rapeseed oil until creamy. Fold the egg mixture into the flour mixture, along with the carrots. Cool slightly before removing from the tin. Whisk together the soft cheese, icing sugar and lemon juice. Spread the icing on the cooled cake. Decorate with the lemon zest.